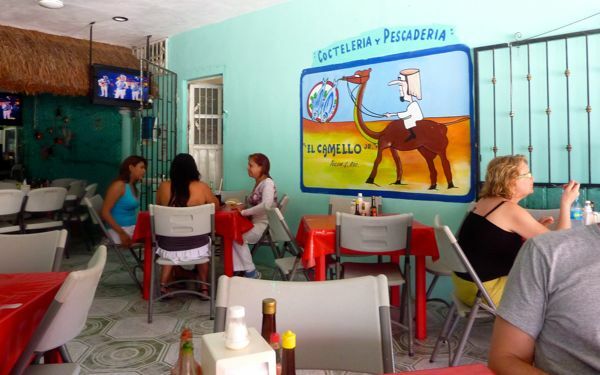 When we last left you, Karagöz was almost marinating in his cóctel de mariscos over at El Camello Restaurant in Tulum Pueblo in the Quintana Roo province of Mexico‘s Yucatan penninsula. Since Karagöz was given permission to dictate yesterday’s post, and since he just gave the culinary highlight, let’s go back and get some context, shall we? 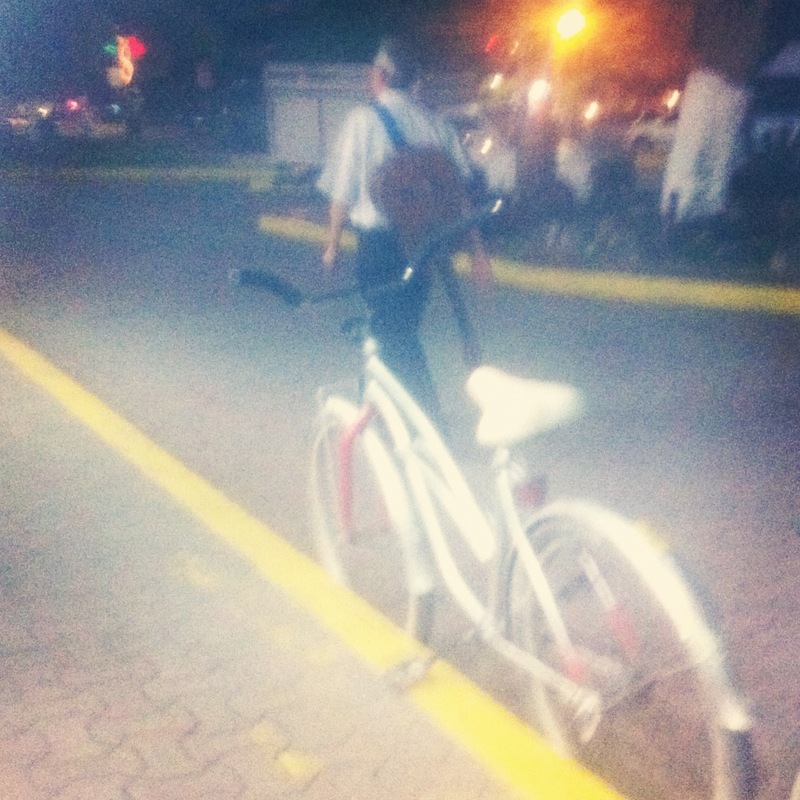 So, at this adventurous puppets’ urging, M. and I borrowed some majorly junky and almost brake-less bikes from our hotel and headed into the selva towards Tulum Pueblo. 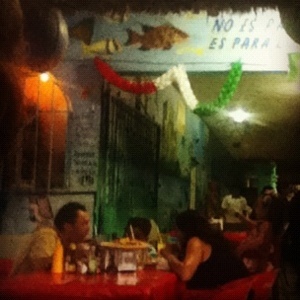 Described by many a snotty tourist book as a “dirty nothing town” south of Cancún, we rejoiced. “Just our cup of Çay,” we thought, as we headed into the great unknown, “something discarded by the touring elite – we’re bound to find some deliciousness there!” Having been told it was a half-hour ride by bike, we set off in the mid-afternoon heat. Observing neon turkuaz parrots along the way, we worked on muscles heretofore unknown and one and a half hours later, ended up in front of a place we had heard of from the local workers in our hotel – El Camello. Fearing we were lost at one point, I broke out my dusty Spanish to ask directions of a lady about my age who was peddling churros on her bicycle. 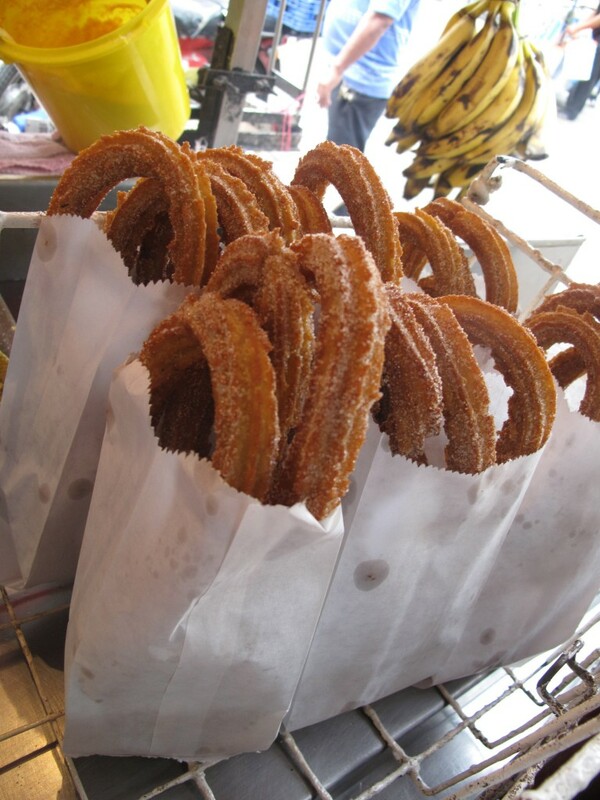 Churros, in case you do not know, are a delicious fried sweet treat. Before I could finish adequately analyzing what her teeth suggested about the Mexican dental system, and the unfairness of globalized inequality, there it was, El Camello, resplendant in scarlet plastic tables and chairs, all over the place. There it was, El Camello, famed mariscos restaurant, and for those not in the know, mariscos is Spanish for seafood…We scoured the menu for our choice of the day as local folks transitioned from watching a Mexican futbol match to the Mexican version of “The Voice” – “La Voz… México.” No Christina Aguilera to be found, but her Mexican counterparts abounded. Thrilled to be in a local establishment, Mercan Bey shot off into the kitchen, where he spent the next hour learning all he could from participant observation – I say participant observation instead of just observation as there were some Mexican Dia de los Muertos (Day of the Dead) puppets in that place (see exemplar photo here from Wikipedia), so they were kind enough to show our very own spice man around. After tucking into his cóctel de mariscos, M. was in a mollusk-ridden coma of drool and beer, so I turned to chatting with our waitress. At one point, I stuck my foot squarely into my ugly American mouth. As soon as the waitress squinched her eyes up at my question, I knew I had pulled an ugly American action…but what could I do? I had questioned the waitress about the meaning of “El Camello,” only to be reminded that it just means – yes – “the camel.” Duh! I was too embarrassed to ask anything else, and just retreated into the “food is amazing” territory to save some face. Famous for it’s seafood, you may well wonder how it acquired the name El Camello – but I guess they’ll never tell! 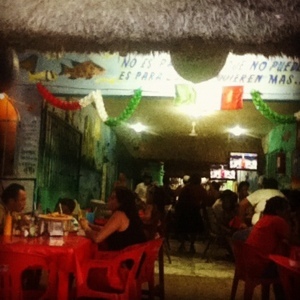 Locals listening to “La Voz…Mexico,” in Tulum Pueblo Mexico at El Camello Restaurant. 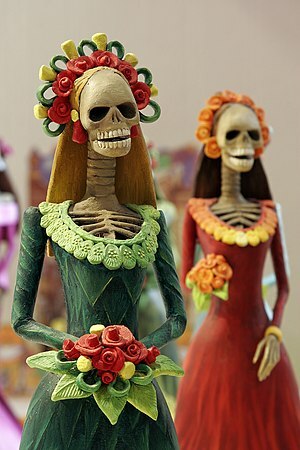 This entry was posted in Puppets on the move around the world, Visits from the Karagöz puppets and tagged çay, Camels, day of the dead, El Camello Restaurant, herbs, Mexico, spices, Tulum, Tulum Quintana Roo, Yucatán. Bookmark the permalink. A wonderful reframe that I can totally buy! I am uber-sensitive to the whole ugly American thing…probably too much so! ¿’El Camello’? – after the sausages, of course!